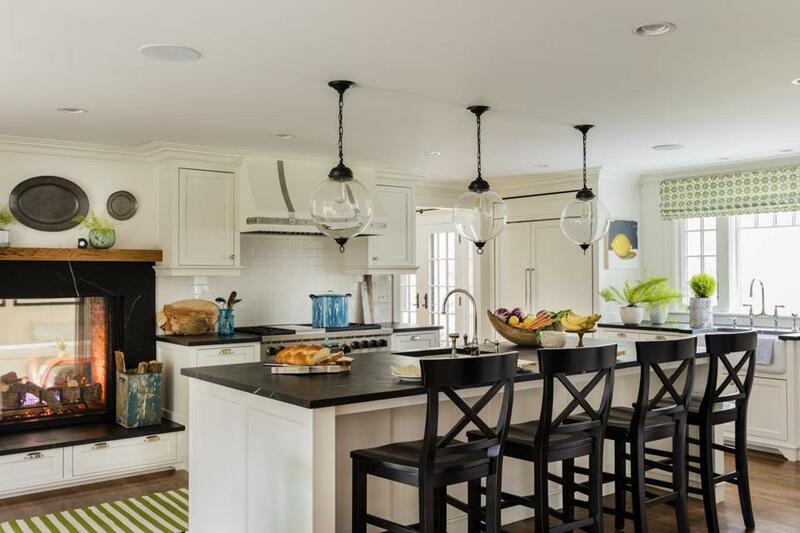 A Sudbury family’s new open kitchen revolves around a color they know they’ll never tire of. In front of the fireplace, a striped Dash & Albert runner brings in the space’s signature green. Above the island, glass globe pendants from Williams-Sonoma Home have bronze finials at the bottom. “Without that finial, the fixtures would get lost in the room,” says designer Kalah Talancy. 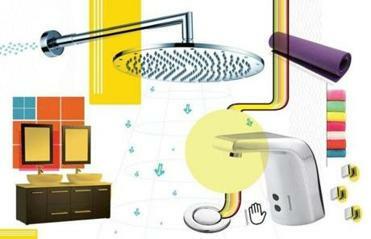 ANY RENOVATION INVOLVES countless decisions. Materials, finishes, and fabrics often evolve after considerable deliberation, influenced by lots of factors. In the renovation of this Sudbury kitchen and family room, the owners — a married couple with four active children — had a simple priority. As the project evolved, they decided they wanted the color green to dominate the palette. The 1960s Colonial was spacious, yet the kitchen was dark and, except for a narrow passageway, closed off from the nearby family room. “The owners wanted a brighter, larger kitchen that was integrated with the family room,” says ten Brinke. Besides opening the rooms to each other, the clients wanted to make space for an ample dining area. A structural wall between the kitchen and a small office was taken down and a flush steel supporting beam installed, “so you can’t tell that it was once two separate rooms,” says ten Brinke. “It looks like one space that has always been that way.” A new bay window bathes the area with natural light. Ethan Allen chairs in custom apple green are paired with a reclaimed-wood table handcrafted by Saltwoods in Watertown. “Whether or not to paint the table legs black was one of those decisions that we agonized over. In the end, it was definitely the right call to paint them,” says Talancy, noting that the black relates to the chalkboard on one wall, which is a spot to display the kids’ artwork and for family members to write notes. A sisal Crate & Barrel rug conceals spills. The oil-rubbed bronze chandelier by Visual Comfort has a timeworn appeal. It was important to stay close to the architectural origins of the home. “The owners didn’t want a builder-spec kitchen or something overly modern,” says Talancy. “The wife has a fondness for antiques and found objects.” Custom cabinets by Groton-based Platt Builders are painted Benjamin Moore White Dove and fitted with polished nickel knobs. The counters are soapstone, a natural material that evolves over time. Not only does the kitchen serve a bustling family of six, the homeowners often host large gatherings of extended family — such as Thanksgiving dinners for 40. “We measured everything very specifically. They wanted to be able to use the island as a buffet, and they didn’t want someone cooking at the stove to bump into someone at the buffet — so we literally measured how many paces would ensure flexibility of movement around the spaces,” says Talancy. The kitchen’s original brick fireplace was replaced with a double-sided gas fireplace fitted with a chestnut mantel and soapstone surround. The fireplace enhances the connection between the kitchen and family room, as does a new second doorway between the spaces. In the family room, subtle greens abound: Armchairs are upholstered with a textured fabric in the hue; deep forest green leather covers the ottoman. On the floor is a reversible woven Bunny Williams rug with citrine tones, designed for indoor/outdoor use. “With kids, nothing can be too precious. The rug will get twice as much wear because it’s reversible, and the ottoman can get beat up and [develop a] patina over time,” says Talancy. 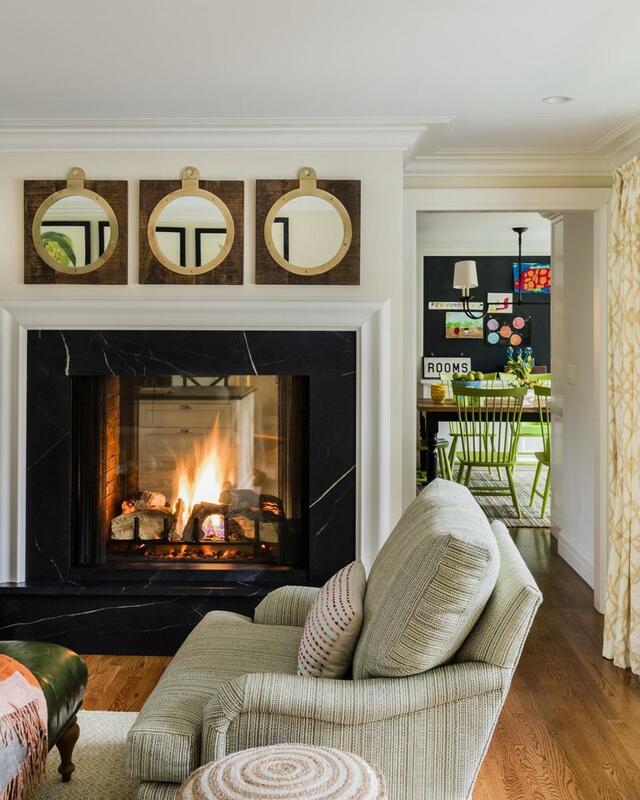 It took months to decide what to hang over the fireplace in the family room. Ultimately, three porthole-shaped mirrors made of reclaimed wood and antique brass filled the space. Three pewter plates hang above the fireplace in the kitchen. The mirrors and plates are distinct from one another, says Talancy, yet they also relate, signifying the separation between the spaces and symbolizing the new link between them. The new double-sided fireplace straddles the kitchen and family room.